Research and innovation in this area will provide the means to reduce Europe's dependency on fossil fuels and contribute to meet its energy and climate change policy targets for 2020. Estimates conclude that a shift to biological raw materials and biological processing methods could save up to 2.5 billion tons of CO2 equivalents per year by 2030, increasing markets for bio-based raw materials and new consumer products several-fold. The key is to develop new bio-refining technologies to sustainably transform renewable natural resources into bio-based products, materials and fuels. This nascent sector is expected to grow rapidly and create new markets and jobs. The rapid pace of technological change, the rising costs of research, the increasing complexity of technologies are all strong reasons for setting up long-term public-private partnerships. This will contribute to stimulate additional European research investment, build critical mass by uniting currently fragmented efforts, and ensure effective and efficient programme management. On 6 May 2014, the Council adopted Regulation (EU) No 560/2014 establishing the Bio-basedIndustries Joint Undertaking (BBI JU) a new €3.7 billion Public-Private Partnership between the EU and the Bio-based Industries Consortium. Operating under Horizon 2020, it is driven by the Vision and Strategic Innovation and Research Agenda (SIRA) developed by the industry. 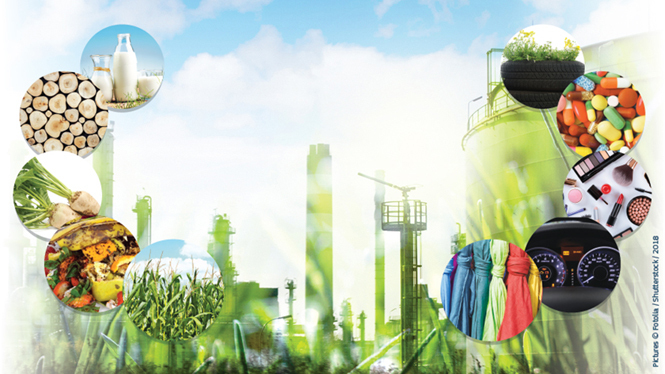 The objective of the BBI Joint Undertaking is to implement a programme of research and innovation activities in Europe that will assess the availability of renewable biological resources and the development of new bio-refining technologies to sustainably transform these resources into bio-based products, materials and fuels. The nascent sector is expected to grow rapidly and create new markets and jobs, especially in rural and coastal areas. The EU has the industrial, research and renewable resources potential. It is now a matter of deploying it in a sustainable manner to compete in the global bioeconomy race. A conference on Innovative bio-based products: Investment, Environmental Impacts and Future Perspectives has been organized on June 2018 and will serve as a platform to present and discuss the considerations emerging from the study.